Johannes Hinterholzer completed his studies at the university of Music „Mozarteum“ in Salzburg with Professor Josef Mayr and Professor Radovan Vlatkovic and had masterclasses with Wolfgang Wilhelmi and Peter Damm for modern horn and with Anthony Halstead and Andrew Clark for handhorn. Already as a student he carried several prizes at music- competitions and in 1998 the First Prize at the „Gradus ad parnassum“ Austria, what led to numerous invitations as a soloist and chamber musician. From 1997 – 2009 he was Principal Horn Player of the Mozarteumorchestra Salzburg. Johannes Hinterholzer has appeared as a soloist with many distinguished symphony and chamber orchestras including the Camerata Salzburg, Mozarteumorchestra Salzburg, the Brucknerorchester Linz, les Musiciens du Louvre Grenoble, the Tokyo Metropolitan Symphony Orchestra, the Collegium musicum Copenhagen/DK, the Munich Chamber Orchestra, the Vienna Chamber Orchestra, and many others. In 2007 he gave his debut as a soloist with Mozarts KV 495 at the Salzburg Festival. Since 2000 he followed invitations for concerts as a guest on the principal horn position of orchestras, such as Symphonieorchester des Bayerischen Rundfunks, Tonhalle Orchester Zürich, Bavarian State Orchestra, Mahler Chamber Orchestra, the chamberorchestras of Munich, Basel and Vienna, the Radio- Symphonieorchester des SWR Stuttgart, etc. 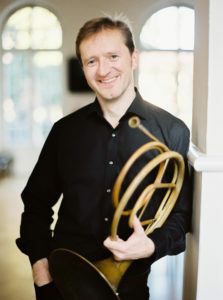 Since 2012 Johannes Hinterholzer is principal hornplayer of the Camerata Salzburg. One of Johannes Hinterholzers special subjects is playing on ancient instruments: baroquehorn and handhorn. Besides many recital programms he performes with Concentus musicus vienna, Il Giardino Armonico under Giovanni Antonini, Les Musiciens du Louvre Grenoble under Marc Minkowski and many other international baroque and classical ensembles. Apart from his work with orchestra Johannes Hinterholzer performes regurlarly as a chamber musician and took part at several international chamber music festivals together with Daniel Gaede, Lukas Hagen, Veronika Hagen, Erich Höbart, Dag Jensen, the Kuss Quartet, Francois Leleux, Andrea Lieberknecht, Benjamin Schmid and many others. in the international press. The recording of Haydns Horn Concerto together with Il pomo d’oro and Riccardo Minasi won an Echo Klassik prize. 2000 – 2010 he was teaching Horn at the Anton Bruckner University in Linz and since 2008 he is Professor for Horn at the Hochschule fuer Musik und Theater in Munich.